It is usual to clean up excess filler putty by filing and sanding. Using an old paintbrush to apply nail polish remover is demonstrated in this video clip. Pure acetone would remove the excess putty equally successfully but would damage the plastic surface.Tip from Aircraft Resource Centre. Links to other sites of prototype interest. Advice and information on modelling from the "Hints Tips and Queries" segment of VMRS meetings and elsewhere. Notes on colour of VR structures. Information about colours used on VR structures in the late 1940s to early 1950s. 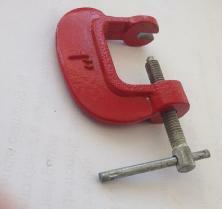 Lindsay B showed us this simple wheel or gear puller that he made from a one inch G-cramp. A simple corner cramp for joining parts at right angles can be cobbled up from simple materials. The main bit is a piece of aluminium corner section with a bir cut out of the angle. 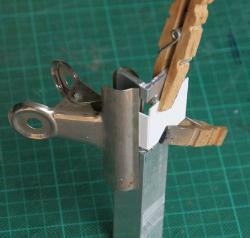 Any simple clip can be used to hold the material or part in place. 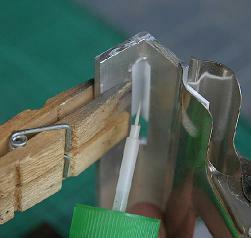 Shown are "inside-out clothes pegs" and a simple office clip. The gap in the back of the angle lets you apply glue or solder tto the inside corner of the job. The aluminium angle with part of the corner removed. Any material could be used as long as it is flat and square. In some situations more complex joints can be made. Apply glue to inside of joint.